Heliconias are striking tropical plants with with thick flower bracts, that sometimes seem like they’ve been fashioned from plastic or rubber. 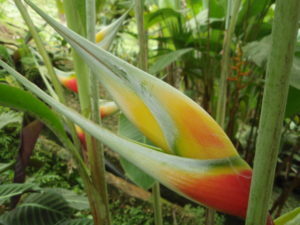 The flowers emerge from the colorful bracts, but its the bracts themselves that command the most attention. You can see the yellow flower in the photo. On a recent trip to Colombia I came across this hairy heliconia, thick and dangling. Almost furry to the touch , it felt like a cross between a monkey’s tail, snake, and a child’s plush toy. 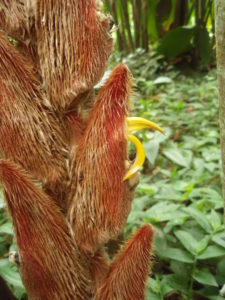 You can see a much more impressive hairy heliconia photo here. 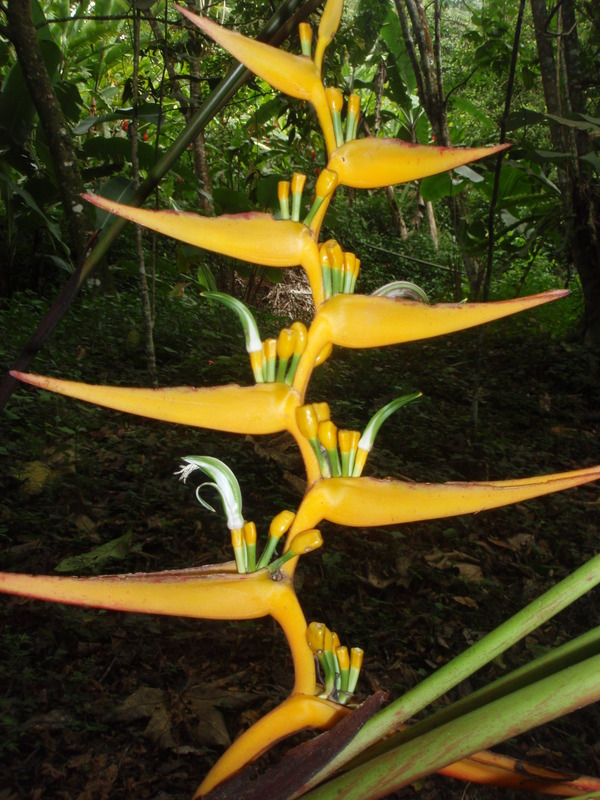 But, for those of you who prefer less hirsute heliconias, here are pictures of some other beauties that I spotted. Don’t even think about growing these as houseplants. Some of these plants are 10-15 feet tall! The flowering bracts can be several feet long too, often dangling on rope-like stem over the steep hillsides like chandeliers.No doubt the colorful bracts can be easily spotted by hummingbirds that tend to pollinate these beautiful flowers. The Jardin Botanico is Bogota, Colombia, is an oasis in this city of 7 million. 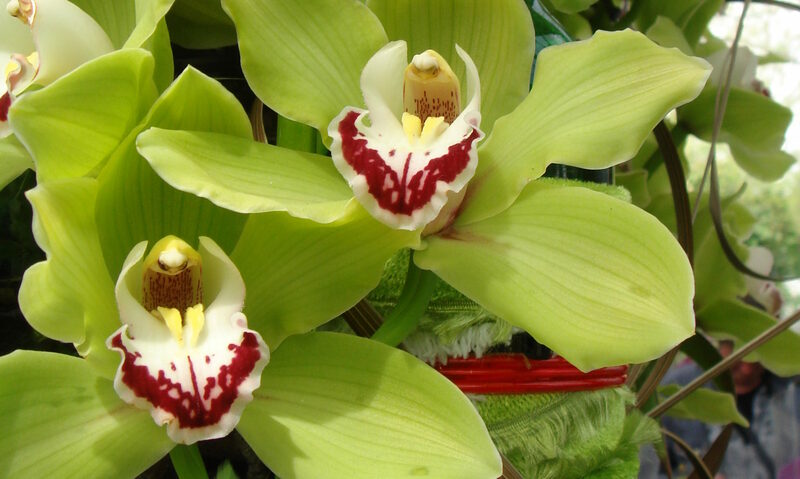 It has a tropical house, including one devoted to orchids which will be featured in a future post. Bogota is more than 7,000 feet above so it has a distinct flora of cooler growing plants. Since I just got back from Colombia, I thought I would throw up a few pictures to brighten up the late winter days! stunning red flower--perhaps a mimosa? Those of you who’ve grown flames lillies (gloriosa superba) will notice that the flowers set pods very easily… The pods are actually quite large and bulbous, and will weigh down the vines seemingly to breaking point. Usually, by the time the plants die down for fall, the seed pods are still very green. Last fall, I saved one of he seed pods but never really expected it to ripen. To my surprise, after coming back from two weeks vacation in Dec-Jan, I saw that the pod had turned black, and had shriveled and split open as if to release its seeds. The seeds themselves were large and round and also a beautiful orange-red color! Next year, I plan to save all the seed pods and enjoy them over the winter. They can be placed decoratively in a small bowl; a nice reminder in the middle of winter that warmer flower-filled days lie ahead… You can see a photo of the seed pod on the plant here in an earlier post. Well, a few weeks ago, I dug up my gloriosa superba(flame lilly) tubers and it seemed they had multiplied in their pot! I wrapped them in a kitchen towel with some dampish peat and then in one of those plastic mesh bags that you buy avocados or clementines in. Remember, these tubers are living things so you don’t want to wrap them up in an airtight or plastic bag, as chances are they will get mouldy and even rot. They’re tucked away in storage closet, hibernating until temperatures warm up again in the spring when I’ll be able to pot them up again. In the meantime, here is an earlier post of gloriosa superba in bloom from this summer. If you want to grow these, you’re sure to find them listed in a garden or bulb catalog this spring.